Home » Transplanting rice; and Sowing at Soo-chow Foo. Transplanting rice; and Sowing at Soo-chow-foo. Transplanting rice; and Sowing at Soo-chow Foo on the Tui-ho. Rice-grounds consist of neatly enclosed spaces, the clay banks surrounding them seldom exceeding two feet in height. The primary operation of tillage-ploughing is performed with a very primitive implement, that consists of a beam, handle, and coulter, but no mould-board, as laying over “the sidelong glebe” is beyond the rural knowledge of a Chinaman. The buffalo, or water-ox, is then called in, to draw the three-barred harrow with wooden teeth over the surface, after which the earth is deemed sufficiently pulverized to receive the seed. Having been steeped in a liquid preparation to accelerate germination, and avert the attacks of insects, the seed is sown, very thickly, and, almost immediately after, a thin sheet of water is let in over the enclosure. After the interval of a few days only, the shoots overtop the water, and this precocity is the signal for transplanting, which consists in plucking up the plants by the roots, cutting off the tops of the blades, and setting each root separately. The last process is aided either by turning furrows with the plough, or opening holes with the dibble. With such rapidity is transplanting performed by the experienced, that with ordinary exertion five- and-twenty plants may be carefully set in a minute. The harrow having pulverized in the first instance, and subsequently diffused the seeds more equally, the hoe is frequently employed to clear between the plants. Each rice field being partitioned into many minor enclosures, it is not attended with inconvenience to-conduct a rivulet into any particular plantation, through an opening in the clay ridge that surrounds it. Sometimes a natural brook contributes a sufficient supply, but more infrequently the labour of the peasant provides it. Chain-pumps, with their lines of buckets, are in common use; a series of flat boards, exactly fitted to the channel through which it is to be forced, confines the water between each pair, forming extemporary buckets. These are worked by a footmill of proportionate dimensions; but labour still more intense is dedicated to this necessary operation of irrigating rice- grounds. In one of the most laborius plans, two men stand opposite to each other on projecting banks of a stream, holding ropes securely attached to a bucket, which is filled by relaxing, and raised by tightening the cords, then by a skilful jerk they empty the contents into a reservoir, or throw it in the direction of the conduit cut for the irrigation of some one field. Another contrivance for the same purpose consists of a long pole, unequally divided in its length, and made to turn on a pivot across an upright post. A bucket attached to the shorter arm of this lever is easily lowered into the water, and, when filled, by the application of a small power at the extremity of the longer armitis soon raised, and discharged into the reservoir. How exactly is the Chinese process of irrigation described in the book of Numbers – “He shall pour the water out of his buckets, and his seed will be in many waters.” The bamboo water-wheel, with hollow fellies, or with buckets, and employed when the quantity of water required, and the height to which it is to be raised, are both considerable, is of ancient existence amongst the Chinese t from them the Egyptians, Syrians, and Persians adopted this useful invention, and European machinists have ignorancly ascribed the honour of the discovery to the very nation that became last acquainted with its value, obstinately designating it the Persian wheel. Irrigation having performed its anticipated work, the rice begins to grow with rapidity; the stalk ranges from one to six feet; it is annual, erect, simple, round, and pointed: the leaves are large, firm, and pointed, arising from very long, cylindrical, and finely striated sheaths; the flowers are disposed in a large and beautiful pannicle, resembling that of the oat. The seeds are white and oblong, differing in size and form in the numerous varieties. As the crop approaches to maturity, the sluices are closed, the waters withheld, and soon the yellow tinge of the ripening grain incites the reaper’s toil. With a sickle similar to our common toothed reaping-hook, the crop is soon cut down on a surface, now rendered perfectly dry by evaporation and absorption; after which the bundles are removed, in frames suspended at the extremities of a bamboo pole, the national mode of carrying, to the threshing apparatus, of whatever kind it may be. The edge of a plank, the margin of a large tub, with a screen drawn up behind them, are the most popular threshing machines employed in the empire; but flails, after which our own are formed, are used on the larger farms, or where there is a considerable quantity to be disengaged from its husks. It is remarkable how much the scholar excels the master in the management of this primitive implement of husbandry; in China, the labourer winds the swingel round, as we do a whip; in the British Isles, it is made to revolve rapidly round the head, by which means it acquires an accelerated velocity, and therefore an increased momentum. Rice, in its natural state, either growing or unthreshed, is called paddy in all Eastern countries, and the process of cleaning it, or disengaging it perfectly from its husks, appears to have, occasioned considerable difficulty to the Chinese, and not to have been quite free from obstructions amongst the more civilized cultivators of this important grain. Amongst both Egyptians and Chinese the machine usually employed for the purpose is. a species of stamping or crushing mill, worked in the-former country by oxen, in the latter by water-power. It consists of an horizontal axis, with projecting cogs, of wood or iron fixed at certain intervals. At right englesto the axis are fixed so many horizontal levers there are circular rows of cogs, acting on pivots fastened in a low wall, parallel to the axis, and at the distance of about two feet from it. At the further extremity of each lever, and perpendicular to it, is fixed a hollow pestle, directly over a large stone or iron mortar, sunk in the ground; the other extremity, extending beyond the wall, being depressed by the cogs of the axis in its revolution, elevates the pestle, which falls again by its own gravity into the mortar. This process is only applied when the quantity to be cleaned is considerable; on small farms, and amongst the poor, a machine, consisting of a single lever, and pestle and mortar, worked by a foot-board, serves the purpose sufficiently well. 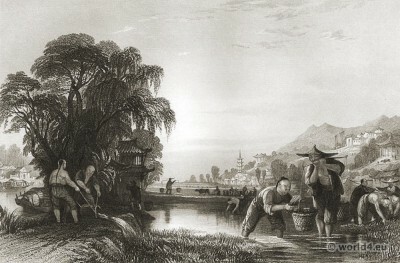 In the year 1826, a patent was secured by Mr. Melvil Wilson, for a rice-cleaning machine; his plan will be at once understood by merely placing the axis of the Chinese mill in a position inclined to the horizon, and giving all other parts in detail the advantage of European excellence in mechanical contrivances. In May or June the first crop is generally cut, and before the harvesting is wholly completed, preparations are begun for a new or second sowing, by pulling up the stubble, collecting it into small heaps, the ashes of which, after burning, are scattered over the surface. The second crop attaining maturity in October or November, is submitted to the operations of reaping, and carrying, and threshing, applied to its predecessor. But the second stubble, instead of being burned, is turned under by the plough, left to decompose in the earth, and become manure for the spring-crop of the following year. Although no Chinese rice finds its way to England, the produce of Anglo-india is imported by our merchants in large quantities. For many years, cleaned rice from Carolina excluded most other varieties; but, as American labour was expended on its cleaning, and as it is the interest of England to import raw materials, and fashion them for the markets of the world by the labour of her numerous mechanics, so we now prefer to import Bengalese rice in the husks, and prepare it for immediate use by machinery of home-manufacture. This entry was posted in 1843, 19th Century, Asia, China, Genre and tagged Landscape, Traditional Chinese costumes on 2/1/15 by world4.